I am a huge fan of Penang, a Malaysian restaurant in Chinatown. I especially love their Satay Bean Curd appetizer, which features crispy fried tofu triangles stuffed with cucumber, bean sprouts and a peanut sauce. I like the idea of stuffing a sauce into tofu as opposed to dipping it into something—it’s kind of genius and looks really fancypants. So I decided to make a similar dish using this idea, but changed it up a bit, incorporating some fresh lemongrass and garlic with a touch of curry and a generous amount of peanut butter to create the rich and spicy filling, which complemented the crispiness of the deep-fried tofu perfectly. Heat the sesame oil in a small pot over medium-low heat. Add in the garlic cloves and saute and stir for about a minute. Add in the scallions and saute for another minute. Add in the lemongrass, curry powder and red chili flakes and stir until blended and remove from the heat. While the mixture is still warm, add in the chunky peanut butter and gently stir until well-blended. Add in the soy sauce, crushed peanuts and cilantro and stir again. Set aside. Cut the tofu block in half and then cut each of those haves into right angle triangles. Cut a small 1/8-inch wide slit in the longest side of the triangle. Dab the moisture off of the tofu with some paper towels and set aside. In a medium-sized pot, heat the oil (enough to submerge the triangles in) over medium-high heat. After about 7 minutes, test the oil’s readiness by inserting a wooden spoon into the pot—if bubbles immediately form around the spoon, the oil is ready. Once the triangles have cooled enough to handle, carefully break open the recess and spoon an overflowing amount of the lemongrass-garlic mixture into it. Serve immediately. Oops! I liked the screen when I saw this photo. Umm…YUM! There is a Vietnamese restaurant in Chapel Hill, NC that has stuffed tofu squares. They are out of this world! I can't wait to make this recipe! 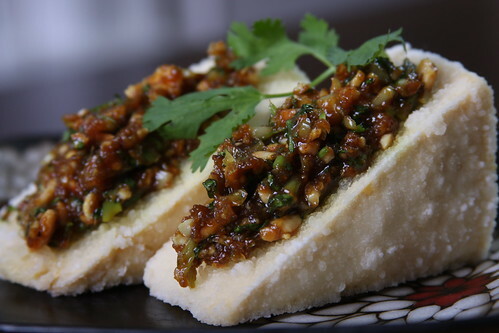 So deliciously looking stuffed tofu! This looks so delicious! I never thought of stuffing tofu what an excellent idea! I love Penang's satay beancurd! My sister and I get it every time we go there. Your adaption looks so so so good. Thank-you so much for sharing this. Thanks jeffie! Nice to see another Penang fan 🙂 ! Stuffed tofu is genius! Why have I never thought of it? Very cool…never seen stuffed tofu before. And with such unusual ingredients too! Wow! That really is fancypants! Those are ideal ingredients to combine–I'm adding this to my list of recipes to try. Thanks! These flavors look fantastic and I am always looking for new ways to elevate tofu. I love the coating on the tofu as well – what a great idea! This LOOKS and SOUNDS AH-MAY-ZINGA!